Range: Generally found from the central Flint Hills west to the Colorado border; within that area, apparently absent from large areas where suitable habitat does not exist. Description: Harmless. Scales smooth. Head much darker than body. 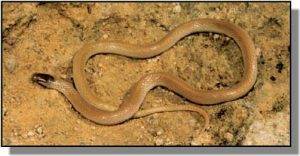 Body and tail overall light yellowish-brown with pink or coral belly. Seven scales on each upper lip. Young same as adults. Habits: Found on prairie hillsides, always under rocks; be sure to check flat debris such as boards and sheet metal (sometimes cow patties). Very secretive; rarely seen in open. Burrows to great depths beneath the ground during cold weather. Never bites. Lays a clutch of eggs in spring or early summer with young hatching in fall. Eats small invertebrates such as centipedes and probably insects and their larvae.